Before the Civil War, before the Great Fire, even before Hyde Park became incorporated as a town, Catholics were worshipping here. The first community was largely of Irish heritage, both businessmen and domestic workers. In 1868,when Hyde Park was a country town, Bishop Duggan came here for the summer. 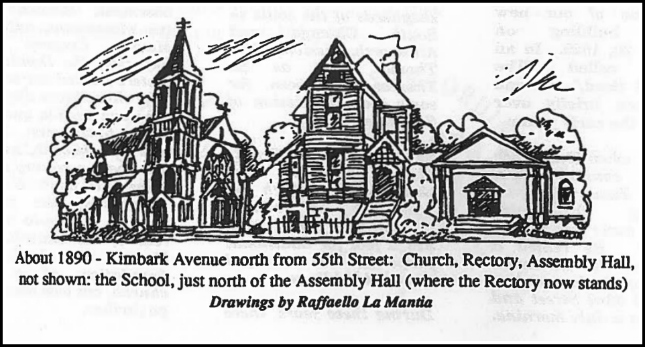 He rented a house on the northwest corner of Blackstone Avenue and 53rd Street, and there, on a July morning, Mass was first celebrated in this vicinity. The first permanent pastor was Rev. Patrick T. Butler, appointed in the Fall of 1868, when the bishop went back to his permanent residence. He was taking care of the Parish until Summer 1969, when he was transferred to the Immaculate Conception Parish in Chicago. He was replaced at St. Thomas the Apostle by Rev. Joseph D. Bowles, who first offered Mass in the old Kenwood School at 51st Street and Lake Park Avenue and then he rented a house on Kenwood Avenue just north of 55th Street. Toward the close of 1869, Father Bowles built the first Catholic church in Hyde Park — a little brown frame structure, on the corner of 55th Street and Kimbark Avenue, facing south on 55th Street. In that church Mass was offered for nearly 20 years through the successive pastorates of Rev. Thomas F. Leyden [late 1869-1870], Rev. Thomas Kennedy [1870-1873], Rev. P. M. Flannigan [1873-1875], Rev. Louis Lightner [1875-1877], Rev. Dennis A. Tighe [1877-1880], and Rev. W. A. Horan [1880-1887]. In addition to caring for their flock in this locality, they were shepherds of the souls in South Chicago and Ainsworth, missions of St. Thomas the Apostle. Within twenty years and before Hyde Park became part of Chicago, before the University of Chicago was founded, and before the World Columbian Exposition; Saint Thomas the Apostle Parish had outgrown its first church and was busy building another church on this site. The second church was built and dedicated in 1890, at the beginning of the long pastorate of Rev. Joseph J. O’Carroll. This time – a large brick building in Victorian Gothic Style. After Fr. O’Carroll [1887-1916], in 1916, Monsignor Thomas Shannon (1874-1959) was appointed pastor and came to be known within the parish as the “great builder.” He was responsible for commissioning all the buildings you see here today. In 1921 he retained Francis Barry Byrne to build a third church, and this was completed in 1924. Architect Byrne had already designed the convent in 1919, and for the church he collaborated with Alfonso Iannelli. Due to the radical nature of both the design and materials used, the realization of Architect Byrne’s conception caused our church of Saint Thomas the Apostle to became known as the first modern American Catholic church. The parish has continued to grow and has been served by many outstanding priests of the Archdiocese of Chicago. Notable among them are two long serving pastors of recent memory, Father Farry and Father Fitzgerald who was honored by the city with the memorial renaming of Kimbark Avenue at 55th Street in his honor. At the end of the 20th century the parish of Saint Gelasius in Woodlawn was merged together with Saint Thomas the Apostle, and the boundaries of the parish were greatly extended southward to include Woodlawn as well as Hyde Park. At the time of the merger the parish was entrusted to the spiritual care of the Carmelite Order, who had served in Saint Cyril’s, Saint Clara’s and Saint Gelasius parishes in Woodlawn since 1890. There are five graduate theological faculties in the parish, including the Catholic Theological Union. There is a high school for boys administered by the Carmelite Order, Mount Carmel High. And Saint Thomas the Apostle Elementary School is a ministry of the parish. St. Thomas the Apostle Catholic Parish is a vibrant part of the Hyde Park community and is committed to meeting the challenges of ministering to God’s People in the 21st century. In 1978, our church and convent were listed on the National Register of Historic Places. In both 1996 and 2014, St. Thomas the Apostle Church was presented with the Paul Cornell Award by the Hyde Park Historical Society. St. Thomas the Apostle was recognized by the Hyde Park Chamber of Commerce as the organization of the year in 2012.